Sadly, this year DARK MOFO is not expanding as far north as Freycinet National Park, so you are not likely to see it on your Wineglass Bay Tour. However, several of our talented producers from Tasmania’s East Coast will be down in Hobart, serving up some truly amazing food and wines at the City of Hobart Dark Mofo Winter Feast. Last year a whopping 427,000 people participated in the almighty awesome Dark Mofo event. A festival that draws people from all around the world. They unite as one in Tasmania, awakening Hobartians from their winter hibernation, and through the power of art, music, light, fire, food and a few straight up pure shots of naughtiness, weirness and fun, the place and its people go wild for a couple of weeks… in fact three weeks this year! One of the greatest drawcards for the big crowds is the Dark Mofo + City of Hobart Winter Feast; a culinary festival exploring the links between ancient and contemporary mythology, darkness and light, birth, death and renewal. It uses large-scale public art, food, music, light and noise to create what I describe as a modern twist on an ancient medieval village celebration. Flames appear everywhere, surprising you and warming your face and extremities as they burst from art installations… more flames appear, this time they warm your cuisine, spiced cider and even gin cocktails. The bitter cold of the winter solstice well and truly leaves your body and soul for the duration of your visit to the Dark Mofo Winter Feast. The other way to attend and spend wisely is to go on Sunday the 24th when entry is FREE! Not only is it free but you’ll get to witness the ogoh-ogoh parade and burning ceremony; an Indonesian tradition in which participants write their fears on a scrap of paper and put it in the belly of an effigy of an evil beast, which is then marched to its final destination on the Sunday evening and burnt to ashes, along with your fears. 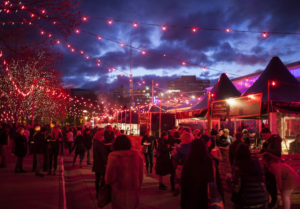 You will want to get to the Dark Mofo Winter Feast early if you plan to go on the Sunday as it tends to reach capacity very quickly. 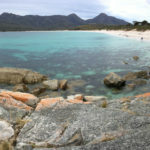 There is no shortage of amazing food and drink on offer at the Winter Feast, but we thought we would make the decision making even easier for you by highlighting the producers who are from our part of the state… the locals from the sunny East Coast of Tasmania, up towards Freycinet National Park and our beloved Wineglass Bay. Sophie’s is the creation of chef Sophie Bermudes, who trained in Bordeaux and has spent the majority of her career working throughout the south-west of France. 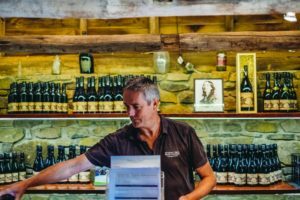 Having developed her keen sense for combining and contrasting flavours and textures, Sophie moved to Tasmania’s East Coast where she has established herself at Milton VIneyard’s cellar door. 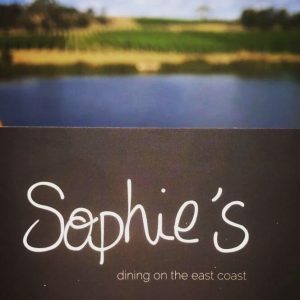 With her French approach to Tasmanian produce, along with a passion for food and meticulous attention to detail, Sophie’s offerings at the Winter feast will have you licking your plate clean. Keep an eye out for Sofie’s cassoulet made with free-range duck and pork. It’d almost be criminal to not match it up with a glass of Milton Vineyard wine seeing as these gives work side by side throughout the year, just north of Swansea on the East Coast. When you visit them at the Winter Feast, be sure to introduce yourself to ‘Laura’. 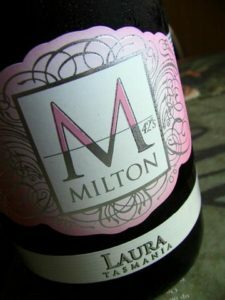 Laura is their complex and distinguished Sparkling Pinot Noir Chardonnay. Let her pretty salmon pink colour give your cheeks the same complexion, ideally with some oily fish. There will be salmon aplenty down at the Winter Feast so maybe take Laura with you to the HUON SALMON stall. Now just to be clear,Huon Salmon aren’t on the East Coast, but to be brutally honest, we kind of prefer the salmon farming to stay that way so Huon Salmon get our nod of approval and support at this year’s Winter Feast. The other absolute gem coming from Milton is their Shiraz. Yes… you read that correctly, Shiraz, in Tasmania! If you do some research and poke around in the right places you will find that there are in fact a small handful of vineyards around Tasmania producing a Shiraz. The next hard bit is finding one that has some Shiraz in stock. Keep your eyes peeled at the Winter Feast for Milton Shiraz and if you are lucky enough to find some, consider yourself and your taste buds very lucky. This Springvale property in Cranbrook, between Bicheno and Swansea has been in Lyne hands since 1875. Initially it was established by Wiliam Lyne and his wife and 5 children. Continuing in Wiliam’s tradition of hard work and innovation, Rodney and Lyn Lyne, 5th generation Springvale farmers, have planted 14.5 hectares of wine grapes. Principally they grow Pinot Noir but they do also produce some lovely Chardonnay, Gewürztraminer, Pinot Gris, Sauvignon Blanc and a splash of Pinot Meunier . It is their 2016 Pinot Noir that warms our cockles this winter. Dark brick red in colour, the Pinot Noir has strong aromas of dark cherries complimented by charred oak and mixed spice. The palate has lively sour cherry and strawberry flavours balanced by savoury oak and a steady touch of tannin. 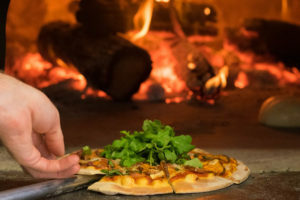 Our friends at Tombolo will be partnered up with the crew from Devils Corner, so there isn’t going to be any shortage of wine to wash down the pizzas. We personally adore the Resolution range from Devils Corner. Resolution by the way was the sloop that Captain James Cook used for his second and third voyages of exploration in the Pacific. Devils Corner produce both a Chardonnay and a Pinot Noir in the Resolution range and we can’t decide between the two which is better as it really depends on what you’re eating with them. Choose your pizza first, and then get the lovely staff to help you pair the wine. 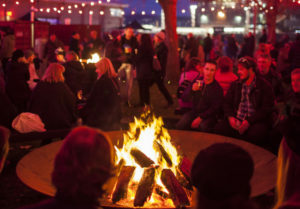 Another provider at the Dark Mofo Winter Feast we are very pleased about, although not technically from the East Coast of Tasmania, is the PALAWA FIRE PIT. Thanks to the culinary awesomeness of Asher Gilding and Franca Zingler, participants will get to learn, embrace and taste traditional fare and native ingredients with Aboriginal Tasmanian hosts. Spaces are strictly limited to 25 guests per sitting, so it won’t come as much of a surprise to read that this Palawa Fire Pit event is a ticketed event, not included in your Winter Feast entry and, as at the time of writing this blog, it is sold out. However you can still register for the waiting list, so jump on that one as a matter of urgency. If you facny a Tasmanian cider, we cannot recommend anything more highly than the foot stomped, hand pressed, wild fermented, unfiltered, unpasteurised Wild Cherry Cider made by our friends at SIMPLE CIDER. It’s an absolute flavour bomb and it is red… what more needs to be said? 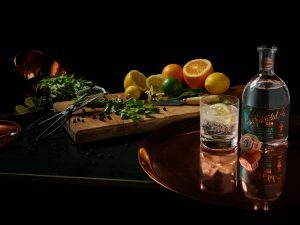 This juice will become a Dark Mofo classic, mark my words. So there you have it folks, there truly is something for everyone at this years Dark Mofo + City of Hobart Winter Feast and Tasmania’s East Coast will be well represented. If you are drinking at the Dark Mofo Winter Feast please do so responsibly. Keep an eye out for your mates too, and don’t let them drive if they have been drinking. If you, your family and friends are looking for a great way to spend the day, before heading down to the Dark Mofo Winter Feast you have come to the right place. We have day tours running to Freycinet National Park and Wineglass Bay throughout the Dark Mofo period.